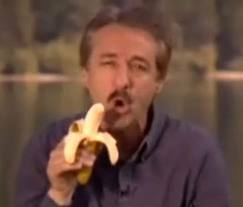 If you're familiar with Ray Comfort, you likely know him from of a video that circulated a few years ago featuring Comfort and former teen heartthrob Kirk Cameron, and a banana. In that video, Comfort and Cameron, discuss how the banana is the 'atheist's nightmare,' because it is so perfectly designed: it has a natural wrapper (perforated and biodegradable, even! ), a pull-tab, fits perfectly in your hand, and it even points towards your mouth as you're eating it. Certainly this is God's design, Comfort argues. Comfort later offered a pseudo-apology after it was pointed out to him that the modern banana, as you and I know it, is the result of thousands of years of domestication by humans. I've seen the film. While I won't deny that the film has changed some folks' minds on the issue of abortion, I think it's more accurate to describe the film as watching a snake oil salesman coaxing kids into a anti-choice stance through dishonesty, logical fallacies, and emotional coercion. Comfort is a skilled showman. He's a carnival barker with a Bible. What he does in '180' has much more to do with manipulation, and backing kids into ethical corners where they feel they must concede to his viewpoint. Most of these same kids would buckle under similar pitches from car salesmen. Comfort poses hypothetical dilemmas for the kids, asking if they'd follow Hitler's orders to bury Jews alive with a bulldozer. If they wouldn't, he asks them why. If they say it's because they value life, he asks them how killing per Hitler's orders is different from performing an abortion. Elie Wiesel responded to Comfort's film by stating, "...Those who call [a woman] a Hitler and relate [abortion] to the Holocaust prove that they do not know what the Holocaust was." The fact that this movie exists is not terribly surprising. It's simply a viral internet version of an argument that has existed for decades. What is surprising, however, is the fact that Ray Comfort is trying to get this film into schools under the guise of Holocaust education. 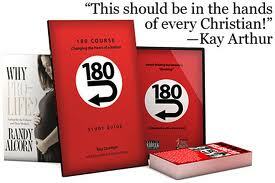 A free DVD of the award-winning viral movie "180" may be coming to a high school near you. The creator of www.180movie.com, Ray Comfort, said "180 received over a million views in 22 days, because it's 'shocking.' It opens with 14 people (mainly college students) who have no idea of the identity of Adolf Hitler. One reviewer said, 'So, what's a pretty good documentary could have been even stronger without the fools early on.' Perhaps those who are quick to call these students fools lack perception themselves. These young people are rather ignorant as to perhaps the darkest period of human history, because the American education system has failed them." Late last month, between 180,000 and 200,000 copies of the 33-minute DVD were given out at 100 of America's top universities, and now the Jewish author and TV co-host is turning his attention to high schools. "No doubt some will say that Holocaust education isn't appropriate for high school kids. However, the United States Holocaust Memorial Museum says that the appropriate age is '11 years of age and older.' Nelly Silagy Benedek, Director of Education, The Jewish Museum (New York) agrees: 'From my experience, the best age to introduce students to the topic of the Holocaust is in high school.'" Ray Comfort wants to teach your child about the Holocaust by showing them a movie about abortion and eternal salvation through Jesus Christ. I hope you won't mind, Ray, if we teach kids about livestock through viewings of Brokeback Mountain, or about the value of physical fitness through viewings of al Qaeda training tapes. "It's evident that many of the States aren't bothering to teach kids about one of the darkest periods of human history. I am concerned that we may become like the U.K. where some schools dropped teaching about the Holocaust for fear of offending Moslems, some of whom deny that the Holocaust even happened. This is more than a travesty, so we are giving hundreds of thousands of kids a free documentary that received more than a million views on YouTube in 22 days. We have already started locally, and they are going like hot cakes on a cold winter's day." Like hot cakes on a cold winter's day... There's that carnival barker again. Adolf Hitler was a Christian. Go ahead, look up some of his quotes. That is all. Hitler was anything but a Christian. The only reason he stated those things was to win the public over. He was a humanist, or in simpler terms, a darwinian atheist.